Okay, some of my foibles aren’t included in the app, which tend to run more toward Leviticus than Seinfeld. “Have you harbored hatred in your heart?” the app asks. “Have you led anyone into sin?” It’s like a medical questionnaire for the spiritually ill. I bet I can build such an awesome Prayerville layout that eternal salvation is guaranteed. Or maybe not. I’m pretty sure that no matter how many Ave Marias I collect, when the great alarm clock in the sky chimes for me I’ll be on the down escalator. Maybe this post gets me into a deeper circle. But here’s the bottom line: The Vatican has already approved the app. The highest authority in the Christian religion (and the most brilliant marketers in history), understand that God needs followers. And what better way to gain followers than to gain… followers? If religion is strictly about penitence and virtuous obedience, maybe the app won’t cut it, but if religion is also about community and service, then this limited method of engagement is a whole lot better than nothing. If that means sporadic iPhone users instead of weekly kneelers, the church has evidently decided to deal. 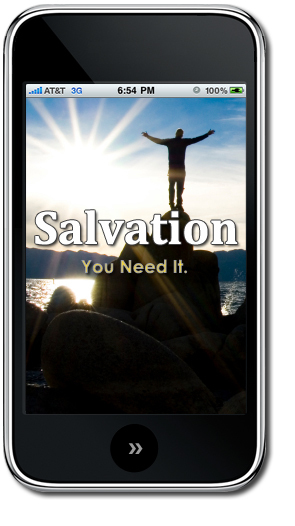 This entry was posted in Marketing, Social Media Marketing and tagged catholic app, catholic iphone, christian app, christian iphone, confession app, confession iphone, iphone app, meaculpa, meaculpa app, meaculpa iphone by Tom Bishop. Bookmark the permalink.